Prednedávnom som sa cez stránku coursera prihlásila na online kurz s témou: Fantasy and Science Fiction: The Human Mind, Our Modern World. Pre úspešné zvládnutie kurzu a získanie certifikátu musím odovzdať aspoň 7 esejí na tému týždňa (10 týždňov - 10 tém). Čo to znamená pre mňa, to viem. Čo to znamená pre vás - pravdepodobne nejaké publikované eseje a prvou bude práve Alica. Enjoy a pokojne komentujte, či už knihu samotnú alebo esej. 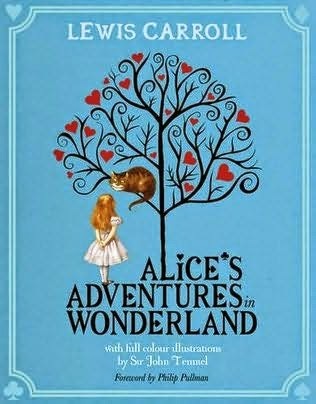 Among other things, Alice’s adventures in Wonderland is a journey of self-discovery of a child turning to a young girl and her acceptance into society. On several occasions, Alice asks herself “Who am I?”, admitting at one point that: “… at least I know who I was when I got up this morning, but I think I must have been changed several times since.” She believes this to be a puzzle and fun to solve. Alice is aware of the changes as she is leaving her childhood and questions her own identity and her place in the world of adults. She frequently asks questions trying to solve and understand what is happening around her, which will help her to find her own place. Throughout the book she is often small and thus helpless or big and grown up and she feels how it is to be the one in power. This duality of size and the fact that “… this curious child was very fond of pretending to be two people,” confirms that the main reason of this journey through Wonderland is to determine who she was and who she wants to be.